The Yamaha Club Series C112VA speaker is a 2-way, suspension-ready 350-watt passive P.A. speaker suitable for club date, lecture, and smaller event applications. The sturdy, spray-finished particle board speaker enclosure of the C112VA, made from the durable southern yellow pine, houses a high power 12" woofer and a 2" dome tweeter ensconced in a 90° x 40° constant directivity horn. The speaker's crossover network offers overload protection, and is assembled with top quality oversized coils, power resistors and high voltage capacitors, designed to produce optimum sound. A set of 12 integral fly points are built into the C112VA cabinet, along with bracket mount attach points and screw terminal inputs for simplified permanent installation suspension. The recessed side-mounted steel handles allow for secure and convenient transportation. The connectors are high quality Neutrik Speakon and Switchcraft 1/4" types, and are mounted in pairs for convenient daisy chaining of multiple units. 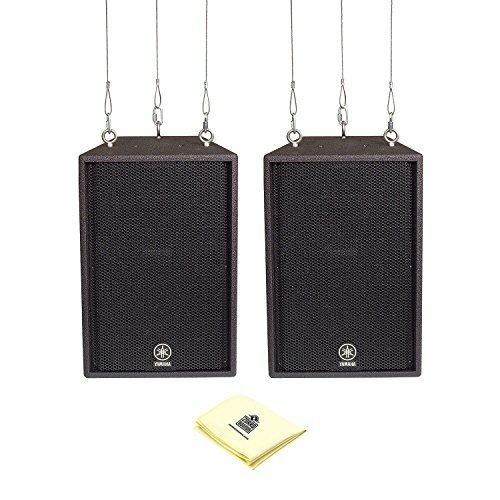 The C112VA is moderately priced, and in terms of the design quality and attendant components, represents a good, no-nonsense value for small bands, schools, lecture halls, meeting rooms, and other like venues.Includes Zorro Sounds Loudspeaker Cleaning Cloth - Keep dirt, grime and fingerprints off your Loudspeaker with custom designed polishing cloth. Plush and non-abrasive, this cloth will safely remove any impurity, so your instrument will shine as brightly as your rock star self.